PM instructs that vote in key ministerial committee will only take place after coordination with the Trump administration. 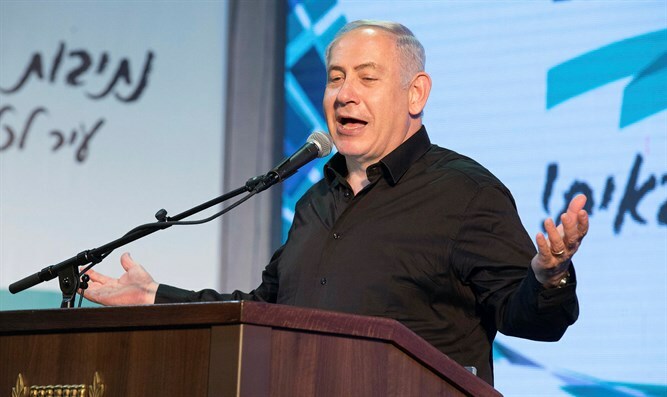 Prime Minister Netanyahu has prevented a vote in the Ministerial Committee for Legislation on a bill which seeks to gradually apply Israeli sovereignty to communities across Judea and Samaria. The bill, submitted by MK Yoav Kish (Likud) was supposed to have been brought to a vote in the committee this Sunday, but the Prime Minister instructed to hold off on the bill’s approval. Tourism Minister Yariv Levin (Likud) told Arutz Sheva that the bill will be brought for a discussion in the meeting of coalition heads, but not in the Ministerial Committee for Legislation until Israel coordinates its activities on the matter with the Trump administration. This morning, Agriculture Minister Uri Ariel (Jewish Home) told Arutz Sheva that he promised that the Jewish Home Party would act with all the political power at its disposal to promote the application of sovereignty. “In the end, there is no minister in the Ministerial Committee for Legislation or MK sitting in the coalition who thinks that we shouldn’t apply sovereignty, certainly over Area C [under exclusive Israeli control according to the Oslo Accords], but whether the Prime Minister will allow it to advance - this I don’t know,” Moalem-Refaeli said.